I’ve always been one of those people that attracts mosquitos. If there’s a mosquito around, it heads straight to the smorgasbord of me and enjoy the feast. And my poor kids seem to have the same gene. They get eaten alive (in fact, I think I get bitten less when these tasty little people are around!). Being young, they can’t stop scratching them. So when we come back from a camping trip (or playing outside at dusk), they end up covered in swollen, red, scabby lumps. Now, I’m a lazy parent and never remember to apply mosquito repellent to my kids (let alone myself) until they start complaining (and by then it’s too late). I’m also a little nervous about what’s in them, especially when on a big camping trip and you need it continuously. I was excited when I was asked to review Para’kito pellets and bands. 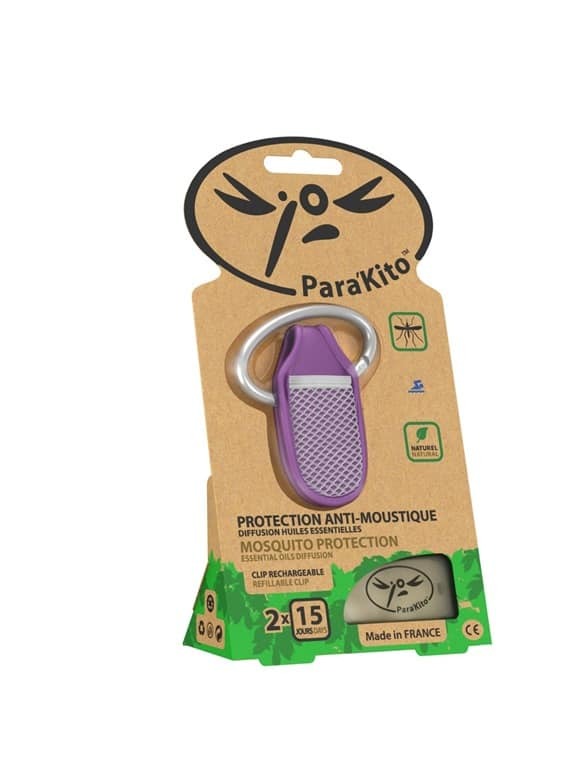 Para’Kito is a 100% natural mosquito and insect protection device that offers 24 hour protection for 15 days straight. Para’Kito is currently the number one seller in Europe and has been hugely popular in New Zealand and Asia, and now it has hit our shores! By employing a combination of seven natural essential oils Para’Kito effectively makes you invisible to mozzies for up to 15 days, it is even waterproof! The fun, fuss-free bands and convenient clips are designed so that there is no direct contact with skin either, making them the perfect product for nursing mums, pregnant women, allergy sufferers and children of all ages. The bands come in a range of colours with a hook and loop tape strap. The pellet is popped in a pocket, you put it on and enjoy the protection! So the first question is, do they work? I first pulled them out one evening, when the kids were playing outside and I spotted my daughter get her first mozzie bite. After putting the band on, she didn’t get any more bites that evening – so that was a success. The band didn’t get in her way when playing, and it’s much easier to pop one on than wrestle with cream or spray, rubbing it in and then remembering to wash hands (then worrying that she’s touched the repellent and put her hands straight in her mouth!). We’ve since popped the bands on when playing in the evenings and no one’s been eaten alive. Unfortunately, we haven’t had the big test of a camping trip. I love the idea of clipping one to the tent zip to stop unwanted visitors (since the kids don’t always zip up). I popped one of the bands on my wrist at home. The smell is quite strong (and after 15 days, the smell is still quite noticeable), but it’s not an unpleasant smell. As someone who doesn’t wear perfume much, it gave me a bit of a headache, so wearing it on my ankle is a better option for me. The bands are a little bulky on a small wrist – not great if you’re trying to look stylish at a barbecue, but it’s a small price to pay to avoid those itchy-bites. To enter, leave a comment with your funniest or worst mosquito bite story. This is a game of skill. The winner will be selected based on originality and creative merit. Judges decision is final and no correspondence will be entered into. One winner will be selected and will receive a Para’Kito Mosquito Protection Pack valued at $90.85. Entries open on 2/6/2014 and close at 11:59pm on 12/6/2014 (Western Australian Standard Time). The winner will contacted via email and have 7 days to respond or a new winner will be drawn. The winner will be announced on Cook Clean Craft once the prize has been claimed. Para’Kito is available at major Australian airports, leading pharmacies and sporting stores or online at au.parakito.com. For more information, head to the Para’Kito Facebook page. Disclosure: I received free product from Para’Kito to facilitate this review and giveaway. All opinions are my own. Coming from New Zealand and liking hiking has many memories of mosquitoes. When you stop tramping the mosquitoes flock to you (I too am a ‘first’ on the mosquito menu). I can’t remember a specific bite, but really don’t like the feeling insect repellant on the skin. Two out of three of my daughters are actually allergic to mosquito bites and flare up in the worst way when bitten. One even had them on Christmas Day so all photos we have of her that Christmas have captured her red, swollen bites! I had a mozzie bite so itchy I couldn’t stop scratching it.Ended up with a bad infection & now have a purple scar to mark the spot the little sod got me. Two of my girls always swell up when they get bitten so once my poor daughter got bitten right in the middle of her forehead so you can imagine what that actually looked like, not a pretty site! We went to a Geocaching event a few weeks back and both my kids got bitten by mossies, I got some bites too, but my son seems to have been attacked by loads of mini mossies! He has all these tiny bite marks and I have great big ones! We had to walk into the bush to look for a Geocache and I was laughing at him doing the “Mossie Dance”! A camping essential, we keep these in our car medical kit we think that highly of them! I have recommended these to all our friends and they have really caught on! Standing outside sweeping my driveway 8 months pregnant, husband comes home from work & says hello, what’s that on your head…to my horror a mozzie had been sitting in the middle of my forehead having a wonderful snack on me, he thinks quick and gives me a mild slap on the head & goes got it! 1 hr later, massive welt in the middle of my head & a raging sense to itch it….was not my best experience with the mozzies!